Verdante is the second 6-story condominium project approved by the city along the east side of Franklin Street. 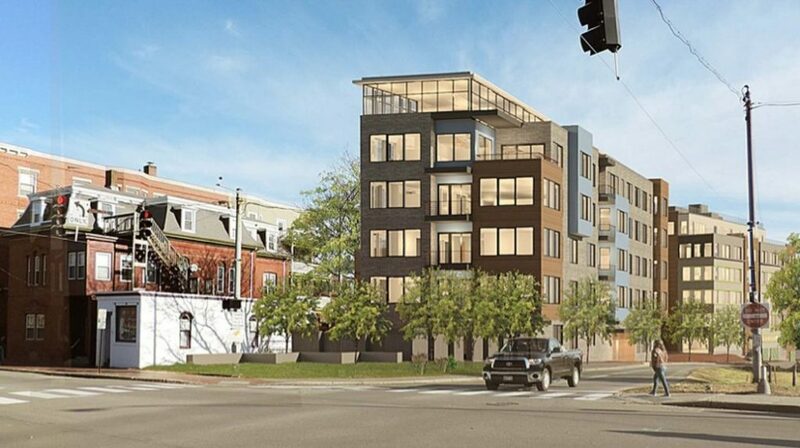 A second, six-story condominium building along Franklin Street in Portland has been given the green light by city planners. The Planning Board voted Tuesday to approve Verdante at Lincoln Park. First proposed in February, the $13 million project is expected to have as many as 30 market-rate condos, retail space and a parking garage for 60 vehicles. The project at 56 Hampshire St. will be located next to the Luminato Condos, a six-story, 24-unit development that was completed and sold out in 2017. Both projects are being developed by the NewHeight Group. City rules require the developer to provide three units that are affordable to middle-income earners. One of those units — a three bedroom unit — will be provided off site at 42 Hampshire St., according to planning documents, while the developer will be paying a fee of roughly $209,400, instead of building the other two. Developers plan to start construction before the end of the year and, according to its website, the project is slated for completion sometime in 2020. Market-rate prices will range from “in the $300,000s” to more than $1 million for penthouse units, according to the developer. Is Winthrop willing to spend $100,000 to save 1 home?